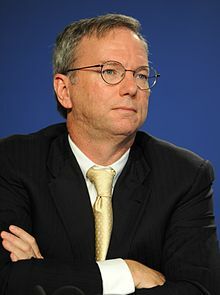 Eric Emerson Schmidt is an American software engineer, a businessperson, and the Executive Chairman of Alphabet, Inc.
Executive Chairman of Alphabet Inc.
Eric Emerson Schmidt (born April 27, 1955) is an American software engineer, a businessperson, and the Executive Chairman of Alphabet, Inc. In 2016, Forbes ranked Schmidt as the 100th-richest person in the world, with an estimated wealth of US$11.6 billion. As an intern at Bell Labs, Schmidt did a complete re-write of Lex, a software program to generate lexical analysers for the UNIX computer operating system. From 1997 to 2001, he was Chief Executive Officer (CEO) of Novell. From 2001 to 2011, Schmidt served as the CEO of Google. He has served on various other boards in academia and industry, including the Boards of Trustees for Carnegie Mellon University, Pennsylvania, and Princeton University, New Jersey. Dinner and Debate by Fortune Magazine.